It’s that time of year when our calendars fill and the relatives invade and the fat man squeezes down the chimney to fill our stockings with all kinds of fun stuff. There will be plenty of fun recipes to share with you over the next month, but today, I thought we’d chat about what working moms want for their kitchens. And yes, I do think kitchen things are excellent gifts–playing with food is FUN, ladies and gentlemen, and new toys make it even more so. I’m going to start with things I have and love that might make your dinnertimes easier, and then share with you my own kitchen wish list. I’ve told you about the pots and pans I adore. Worth the investment. Start with a large fry pan and a stock pot, and go from there. A simple, basic slow cooker. I like the one with a simple dial and three settings: low, high and warm. I have a four-quart that’s fine for our family 90 percent of the time, and a seven-quart I haul out for huge batches of food. A stovetop cast-iron grill/griddle. Go for a two-burner model, season it well, and never let it touch soap. We use ours all the time and I suspect you will too. Be sure you get the kind that flips over and not one that’s only a grill. Good knives. Start with a santoku if you don’t have a good chef’s knife–it should feel solid and heavy in your hand, and is a fantastic multi-tasker. Once you have that, go for other knives–a bread knife, a paring knife, a tomato knife, and an all-purpose 5 inch knife, along with a set of kitchen shears. NEVER put them into the dishwasher and have them professionally sharpened once a year. You won’t believe the difference between cheap and quality knives. I promise. Mine are Wusthof Classic, and I absolutely adore them. A Kitchen Aid stand mixer. There simply is no substitute. Even in a tiny kitchen. Make room. I use mine almost every day–it’s that versatile and powerful and easy. Pimping out is optional. A digital thermometer/timer. Again, I use it every day. Time your cooking, get an alert when meat reaches its optimal temperature, and be sure your food is cooked to safety levels. A bread machine. I don’t have a specific brand to recommend, but be sure you get one that’ll handle a 2-pound loaf and has a dough cycle. Dump in your bread ingredients and walk away. 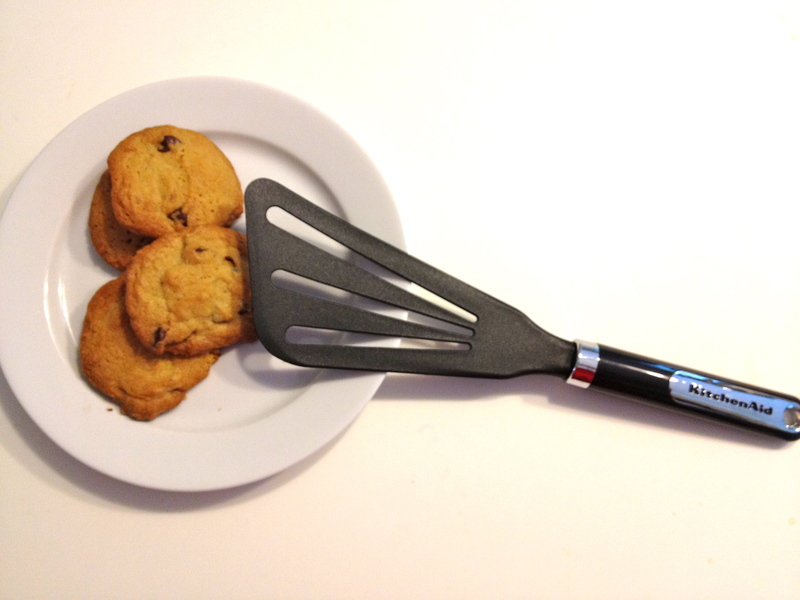 No kneading, no worrying about rise time. I put everything from pizza dough to cinnamon rolls in mine. Love, love, love. A pizza stone. Trust me. Awesome. A Microplane. Good for everything from zesting fruit to grating fresh Parmesan cheese and whole nutmeg. Another thing I reach for all the time. A Keurig. I have a really good coffee maker (it’s a Cuisinart with a thermal carafe–the thermal carafe is key, y’all) but don’t always want a full pot. Mama wants a single-cup coffee maker too. A mandoline. There’s nothing like one of these when you want even, quick slices of something. Don’t ask me why I haven’t just bought one, but I haven’t. Maybe this year. Saturday, DH took the kids out for the day giving me a whole non-work day to my lonesome. Woot! There was lots to do–a feature to finish writing, soccer cleats to be bought, last-minute school supplies to be found, and a birthday party gift to be purchased for a party yesterday. I buy my spices at a bulk Amish market: they’re fresher and much cheaper than those in the little jars at the grocery store. But they come in big plastic containers and storage is an issue, both because they take up a lot of shelf space and because they’re just not very attractive. See? I’ve been looking for alternate storage for awhile, but I don’t want the metal magnetic jars that are so popular right now and didn’t want to spend a fortune. These little glass jars are perfect–the lids have both shakers and spoon-holes in them, and they look super pretty in a little glass-doored cabinet in my kitchen. 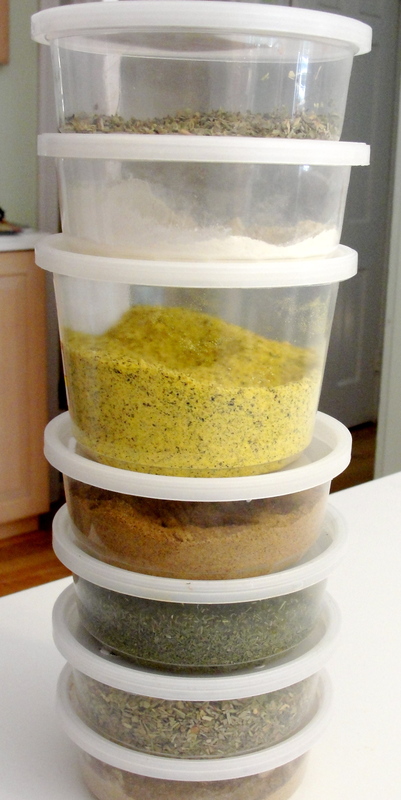 They’re all filled up with the loot from my last Amish market run–lemon pepper, Italian seasoning, dried oregano, ground cumin, ground cardamom, cinnamon, garlic powder, and dill weed. The leftovers went into the freezer in their plastic containers, where they’ll keep for a long time. 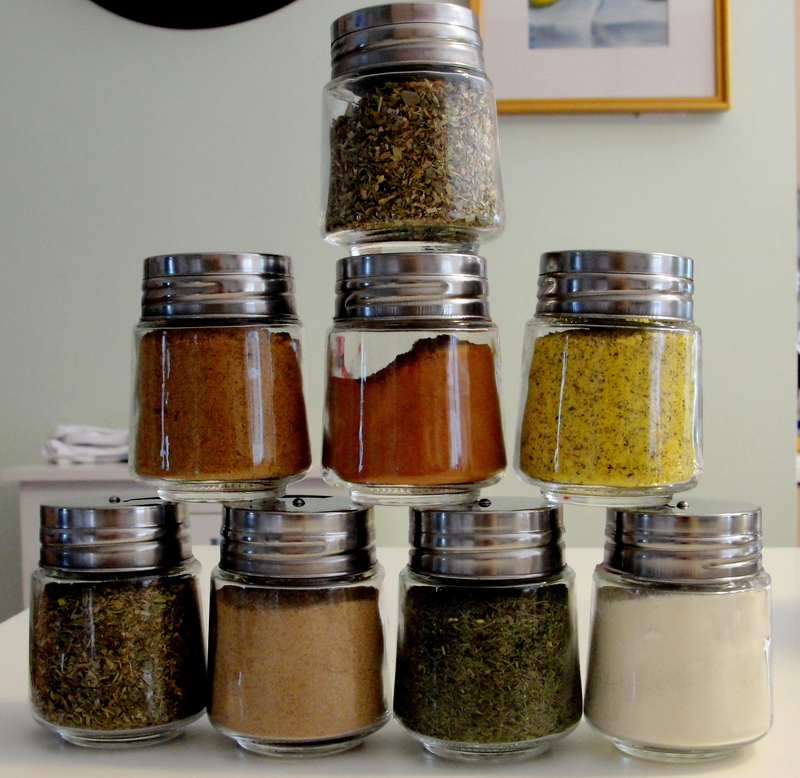 How do you store your spices? And what are your favorites? Leave me a comment! Happy Saturday to me and my kitchen. It smells amazing in there!